Since at least 1907, Ukrainian students have been a part of the University of Illinois. Ukrainian Illini have included chemists, civil engineers, economists, electrical engineers, food scientists, historians, home economists, lawyers, librarians, literary critics, medical doctors, musicians, political scientists, professors, teachers, transfer students, and writers. Read on to learn more about early Ukrainian Illini! A 1962 Illio group photo of the new Ukrainian Student Association, found in Record Series 41/8/805. Prior to the January 25, 1918 Ukrainian proclamation of independence, the first Ukrainian Illini were Jewish men who helped build academic programs at the University and buildings in Chicago and across the world. Abraham S. Epstein Illio Photo from the 1912 Illio, Page 52, found in Record Series 41/8/805. 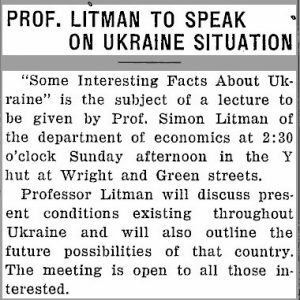 An April 13, 1919 Daily Illini article announcing a talk about Ukraine by Prof. Simon Litman, found in Record Series 41/8/802. A 1912 Illio humor article describing Prof. Litman’s always-present satchel, found in Record Series 41/8/805. 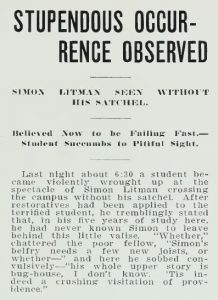 A December 17, 1925 Daily Illini features article about a Simon Litman off campus talk, found in Record Series 41/8/802. Prof. Litman was a member of Ivrim, the Commercial Club, the Menorah Society, Cosmopolitan Club, Theta Delta Pi (the professional foreign trade fraternity), Beta Gamma Sigma (the honorary commerce fraternity), Pan Xenia (a foreign trade student organization), and Phi Kappa Phi. Prof. Litman was regularly involved in student life, evidenced in the sheer volume of student organization memberships and citations documented in both the Daily Illini and Illio. 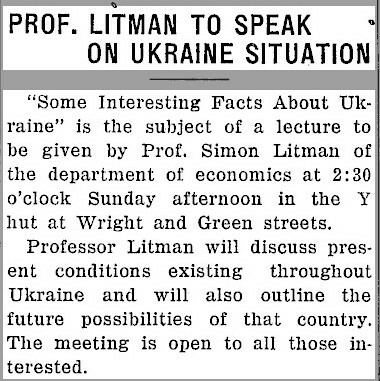 Given his scholarly training and his personal history, Prof. Litman was a regular campus resource for understanding economic changes in Ukraine and Russia too. Although he retired in 1942, Prof. Litman remained involved in the University and returned for visits. During retirement, Prof. Litman wrote a biography of his wife and his own autobiography which is available online through the Library. Concurrent with the arrival of early Ukrainian Illini, the University Library was actively building a multi-lingual newspaper collection including Ukrainian language newspapers at least as early as 1918. Today, there are more Ukrainian language materials in the library than one person could read in a lifetime. Readers should be sure to visit and utilize the wealth of Ukrainian studies resources available through the University Library’s Slavic, East European, and Eurasian Collections and Services and the University Archives too. In fact, the University Archives has two memoirs which document personal experiences in Ukraine during this transitional time. First, there is a typewritten 341-page memoir of Ukrainian Biologist Dr. Boris Ivan Balinsky. Dr. Balinsky’s memoirs include recollections of his early life in Kiev and Irpen from 1905 until he left during the 1940s. Second, at the time of Dr. Balinksy’s departure from Ukraine, Professor of Animal Physiology Dr. Andrew V. Nalbandov joined Illinois faculty. The Andrew V. Nalbandov Papers contain his father Vladimir Nalbandov’s memoirs which include revolution in Crimea, his family’s westward departure, their arrival in the United States, and photographs. Following World War Two, more Ukrainians came to Illinois. Like some Latvian Illini, Ukrainian Illini and other students could not return to their country of origin due to the aftermath of World War Two fighting and the change of governments following the war’s conclusion. These students had to leave their homes, but schools like the University of Illinois accommodated displaced students to enable them to continue their lives. The accommodation of displaced peoples required the involvement of many different University groups. The Board of Trustees provided scholarships, fraternities and sororities provided housing, local merchants donated clothes, and religious organizations along with student groups provided social events to welcome the students to their new home in Illinois. In September 1949, displaced person and incoming freshman Sergej Butkoff arrived on campus. Upon his arrival, Mr. Butkoff was the seventh displaced student to arrive and he was the fourth displaced student sponsored by the student senate, the Daily Illini reported. Shortly after his arrival on campus, Mr. Butkoff and fellow student Nick Goncharoff spoke to a local Lions Club at the Hotel Tilden-Hall to describe their prisoner of war experiences and why they sought U.S. citizenship. Multiple campus organizations welcomed displaced students like Mr. Butkoff through providing financial support, housing, and special invitations to campus events. For example, displaced students were guests of honor at an October meeting of the Y.M.C.A. international supper club. The event included a dinner and a meet-and-greet for any students interested in meeting the new students. Another example was the annual “Christmas Around the World” program, organized by the American Association of University Women and the YWCA. At these events, students told attendees how Christmas was celebrated in their country of origin. 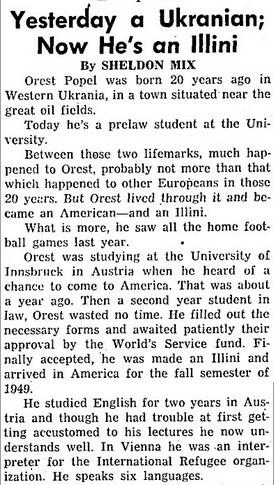 An April 4, 1950 Daily Illini interview with Orest Popel, found in Record Series 41/8/802. Mr. Nickolai Theodor Goncharoff (B.S. Electrical Engineering, 1953), sometimes known as “Nick”, “Nickolas”, and “Nicky”, grew up in a town outside of Kharkov but spent his high school years in a labor camp and a displaced persons camp as a result of World War Two. Following graduation, through his church, Mr. Goncharoff came to the United States where he studied English in a night school before completing his bachelors degree at the University of Illinois. Nikolai T. Goncharoff Illio Photo from the 1953 Illio, Page 457, found in Record Series 41/8/805. During his time as a student, Mr. Goncharoff was frequently interviewed about Ukraine, Russia, and the Soviet Union multiple times in the Daily Illini, in addition to many talks he gave around campus. For his entire undergraduate study, Mr. Goncharoff gave talks about his war experiences and he became a leader in student life. After graduation, Mr. Goncharoff joined the YMCA and served a distinguished career. 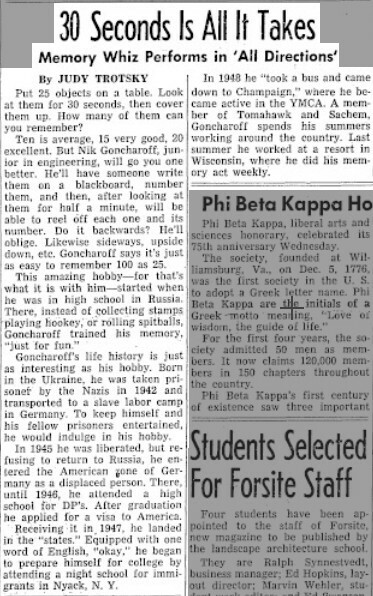 A January 15, 1949 Daily Illini features article about Nickolai Goncharoff, found in Record Series 41/8/802. 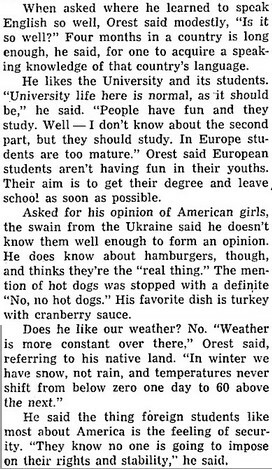 A December 7, 1951 Daily Illini features interview with Nikolai Goncharoff, found in Record Series 41/8/802. For fifty-five years, the Ukrainian Student Association has served Ukrainian students on campus. 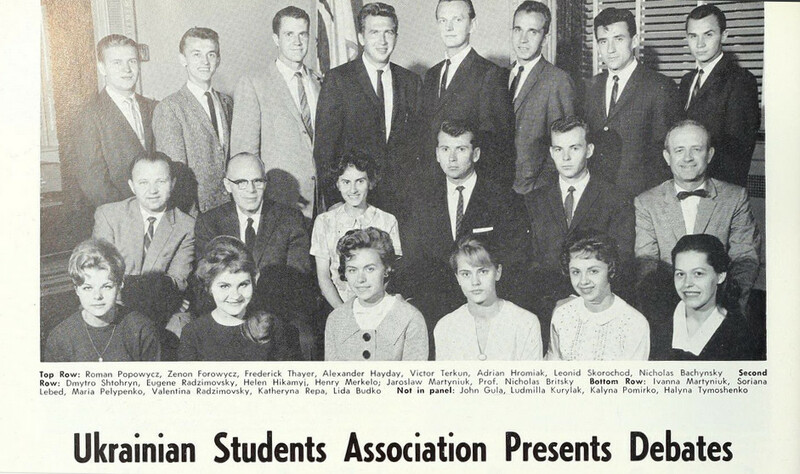 In fact, it was 1961 when 17 Ukrainian Illini formed the Ukrainian Student Association. Under faculty advisors Prof. Nicholas Britsky and Prof. D. Michael Shtohryn, students organized to: “foster greater interest of American Youth of Ukrainian descent in the fine arts and customs of their ancestors”; “provide facilities for social, athletic, and scholastic advancements.” The first officers were president Henry Merkelo, secretary Olena Hikawyj Saciuk, and treasurer Jaroslaw Martyniuk. 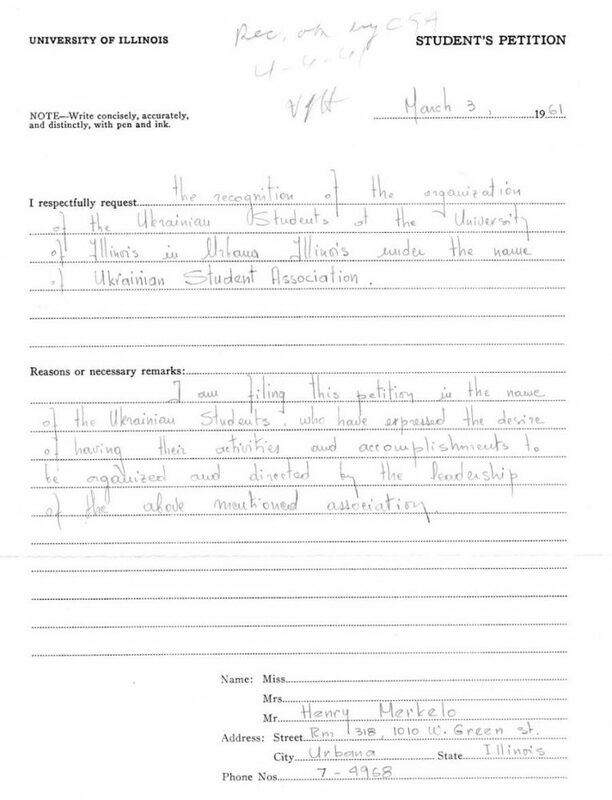 The first page of the Ukrainian Student Association registered student organization application, found in Record Series 41/2/41 Box 2. The Ukrainian Student Association has organized cultural events, dances, debates, dinners, and other special events on campus. In fact, since the establishment of the Association, multiple editorials can be found in the Daily Illini in support of accurate reporting. 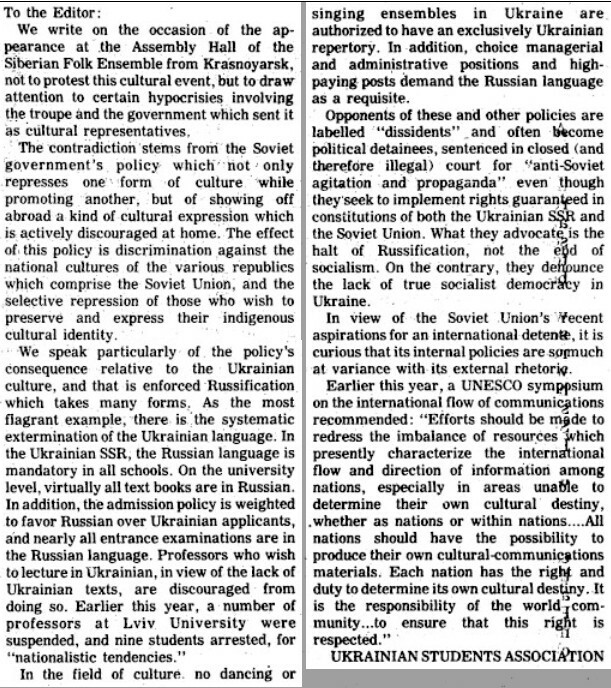 A November 16, 1974 Daily Illini editorial by the Ukrainian Student Association, found in Record Series 41/8/802. 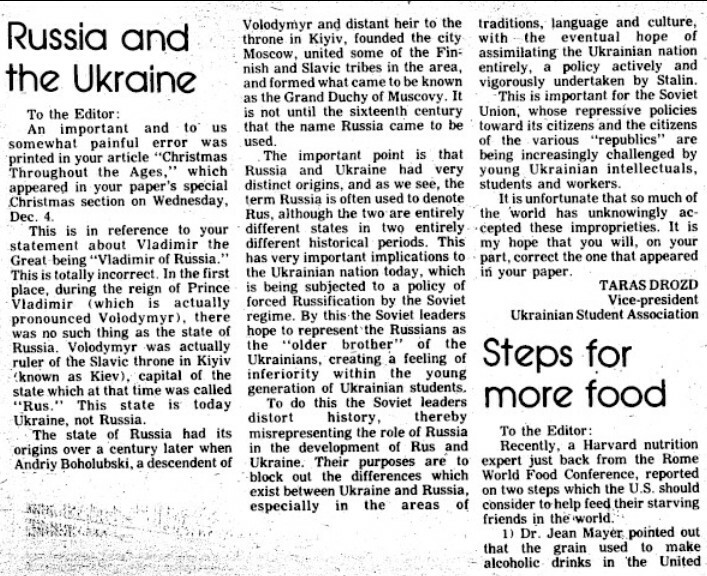 A December 11, 1974 Daily Illini editorial by the Ukrainian Student Association, found in Record Series 41/8/802. Following decades of expanded growth in student enrollment and interest in the region, Ukrainians in Illinois organized to develop and to fund Ukrainian Studies at the University. In the early 1980s, Illinois professors in collaboration with the Russia and East Europe Center (now Russian, East European, and Eurasian Center) developed an annual Ukrainian conference series. 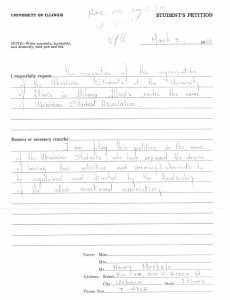 Only a few years later, on August 27, 1985, the Foundation For Ukrainian Studies at the University of Illinois (now Chicago Foundation for the Advancement of Ukrainian Studies at the University of Illinois) was founded. 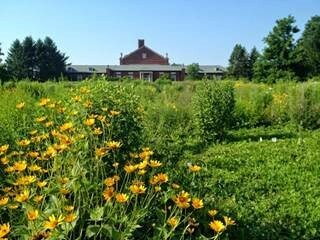 Since 1989, the Foundation: funds the scholarly activities of the Ukrainian Research Program, sponsors the Ukrainian studies programs, financially assists students with Ukrainian studies, and supports development of the Ukrainian collection in the University Library. For over one century, since the first student arrived, Ukrainian Illini have come from a variety of backgrounds, studied a variety of fields, and contributed enormously to Illinois. An October 1, 1968 Daily Illini advertisement for the Ukrainian Student Association, found in Record Series 41/8/802. Are you an Ukrainian Illini? Do you know someone who is? We’d like to hear from you! Please send us a message or leave a comment below. We want to include you and your story, as we celebrate the first 150 years of the University of Illinois. Summary information can found in the obituary of Mr. Epstein’s son Sidney Epstein. Please see: “Sidney Epstein, former Chicago engineering firm chairman, dies at 92” by Blair Kamin, Chicago Tribune, February 5, 2016. For broader company history and historic photographs of Mr. Epstein and his sons, please see the Epstein company website. For more information about Mr. Sidney Epstein, (B.S. Civil Engineering, 1943) another Illini like his father, please see the oral history transcription available at the Art Institute of Chicago. Finally, a description of the major Jewel construction project can be read in the Tribune too. Please see: “Jewel to Build Big Project in Melrose Park”, Chicago Daily Tribune, July 24, 1953, page 7F. Some records of Ivrim meetings can be found in Daily Illini articles from 1907 to 1912. “Epstein Will Speak at Engineering Presentation”, The Daily Illini, April 30, 1948, page four. Additional information on the award can be read in the Edward E. Bauer Papers Record Series 11/5/36. 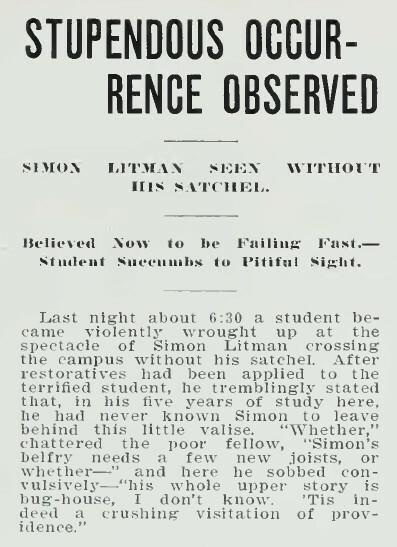 “Simon Litman”, The Alumni Record of the University of Illinois at Urbana, 1918, page 908. From 1908 until 1956, there are almost 500 Daily Illini articles which mention Prof. Litman. Throughout the student publications, careful readers will notice that there are multiple humorous articles lampooning or quoting comical interactions with Prof. Litman. “Prof Litman to Discuss Wartime Prices Tonight”, The Daily Illini, February 19, 1919, page 5. Also, there are almost thirty Daily Illini articles which announce or summarize Prof. Litman’s talks about Ukraine or Russia. “Many Foreign Newspapers are on File in Library”, The Daily Illini, November 2, 1917, page 7. “Butkoff, 7th DP, Arrives at UI”, Daily Illini, September 23, 1949, page 1. “POWs to Address Club”, Daily Illini, October 19, 1949, page 2. For more information on the history of the Hotel Tilden-Hall, please see the detailed, Champaign County Archives blog post “401 North Neil Street – Beardsley Hotel“. “Displaced Students to be Welcomed by YM, YW”, Daily Illini, October 22, 1949, page six. “Christmas Around the World Program will be Given by UUAW, YWCA”, Daily Illini, December 15, 1949, page 7. “The Party Line …”, Daily Illini, October 17, 1950, page 4. For interviews, please see: “No War with Soviet-People, Russian-Born Student Says”, January 18, 1949, page 1; “Russian-Born Student Explains Feelings of His People Against Communism”, October 21, 1949, page 1; “2 Russian Refugees Reunite at YMCA After Parting in German DP Camp”, October 11, 1950, page 6 . For talks across campus, please see: “Russian to Relate Life in German Prison Camp”, January 15, 1949, page 2; “Russia Biggest Concentration Camp in the World, Goncharoff Tells Club” by George Seeberger, April 27, 1949, page 4; “As Others See Us to be Panel Topic”, September 23, 1949, page 2; “Ex-Russ to Aid at Talk”, April 29, 1950, page 1; “Disciples Dictum”, May 20, 1950, page 5; “Foreign Students Number 400”, November 3, 1951, page 5. A full list includes: Prof. Ralph Fisher, Prof. Maurice Friedberg, Prof. Marianna Tax Choldin, Prof. Nick Holonyak (BS 1950, MS 1951, PhD 1954), Prof. Nicholas Britzky, UIC Prof. Bohdan Rubchak, and Prof. Dmytro Shtohryn.